For my spring break, I jumped at the chance to do a road trip to the desert land next door, Arizona! Click here for a simple guide on our roadtrip itinerary! After passing through Utah, we hopped on over to Arizona and stayed in Page for the night. It was a nice change in environment because there was a variety of restaurant and food options, something we missed out on while staying at smaller cities in Utah. Our favorite two destinations included the Lower Antelope Canyons and Horseshoe Bend! Visiting the Antelope Canyons definitely fell on the top of the priority list when we decided we were going to travel to Arizona. It's one of those, infamously gorgeous spots, that also felt a little bit basic cause, yannow, everyone goes there. I have to admit that I initially wasn't the most excited for the canyons, because I thought -like many trendy things nowadays- it was probably overhyped. But the moment I stepped foot inside, I legit could not stop gawking. No photos do it justice, and I would highly recommend it to anyone visiting Arizona. When you first approach it, it looks like a bunch of sandy desert ground with a long crack in the ground. We debated for a long time on visiting the Upper vs Lower Antelope Canyons. The Upper Canyon has the benefit of seeing the light beams, but are often more expensive and crowded. The Lower Canyon is less crowded, slightly less expensive, and has many stairs to climb up and down. We opted for the less crowded and less expensive option, and we did not regret it in the slightest. To visit either canyon, it is required to book a tour! We decided to go with Dixie Ellis' Sightseeing Tours, at about $38.10 per adult. We had an amazing experience touring with them! Our group was still adapting to the slight time changes between all the different states. A thing to note, most of Arizona does not observe daylight savings time from March through November each year. From March to November during the Daylight Savings adjustment, Arizona is on Pacific Daylight Time (PDT). The remaining portion of the year, Arizona operates under Mountain Standard Time (MST). Now, this is pretty confusing, but important to understand when you are trying to make it to your tour on time. For us, we were driving from just inside the border of Utah to Antelope Canyon for our tour, and did not even realize that Arizona was operating under PDT while Utah was operating under MST until a kind waiter casually mentioned it to us. Honestly, it was kind of hard for us to organize and keep track, so what we did was just google "What time is it in Arizona" and went with that haha. Iphones often automatically change for you as well, but something good to be aware of! What the canyons look like from the top down view! Shot on Iphone. Our group ended up being a little bit late to our tour (our tour was scheduled to begin at 11:15AM and we arrived at 11:13AM so not TECHNICALLY late), but the tour group was very accommodating to us and even though our group had already left, they stuck us with another tour guide and we ended up getting a private tour for the four of us! Although I am not recommending anyone to be late on purpose so you get a "private" tour, we were all very thankful for still getting to attend the tour despite our lateness! 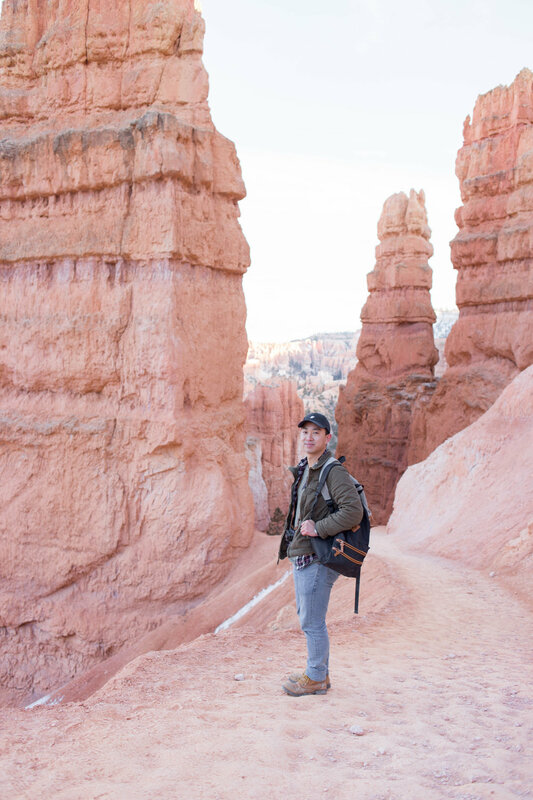 We ended up getting paired with Wila, the funniest, most chill tour guide who was not only full of Navajo history and geology facts, but also knew ALL the best photo spots. He grabbed my phone out of my hand and initially I looked at him like "uh excuse me dude" but then he pointed to a perfect nook in the canyon and said "go stand there and look up" and snapped quite a few photos of the each of us. By the end of the tour, maybe because he heard me and Phoebe call out to our boys constantly for pictures, he learned all of our names and we all joked around like we were friends. We laughed so much, and Wila kept us on schedule (cause honestly if there was no tour me and Pheebs would probably have spent like 3 hours inside snapping photos) while still giving us opportunities for gorgeous photos. Coming out towards the end, the tour offered all of us waters to keep hydrated, which was a gesture we all highly appreciated. Favorite Tour Guide Ever ! The colors are beyond amazing, and it is slightly frustrating because none of the photos do the canyons justice. The tour took about an hour, but honestly it flew by way too quickly. If we had more money I'm sure we would've wanted to visit the Upper Canyons as well, just to compare, but overall the Antelope Canyons was among everybody's favorites of the entire trip. Only a short drive from the Antelope Canyons, our next stop was to visit Horseshoe Bend! The hike was very short, only 0.75-ish miles to the view point from the parking lot. It was a little bit crowded, also probably because we went smack dab in the afternoon. Many people were climbing the edges, hanging their feet over, but goodness my stomach was fluttering like crazy. Phoebe pointed out it was probably due to the STEEP (girl when I say steep i mean like a freakin' straight drop down) hill edges. Nothing to break your fall if you slipped on over, so this viewpoint actually scared me way more than I expected. The Colorado River flowed beautifully in the horseshoe shaped bend, and it was still a beautiful sigh to behold! Thanks for the gorgeous views Arizona! Wish we could've stayed longer!